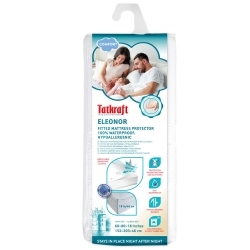 Perfect in use and 100% waterproof mattress protector to comfort your life - no chance to wet the mattress with liquids. If your child sometimes comes to sleep with you, the mattress protector helps in case of night accidents. It helps to avoid sweat and heat too. 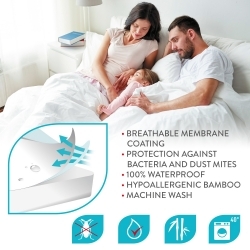 Hypoallergenic bamboo protects against bacteria and dust mites, eco-friendly material. Your child will not get any skin reaction. The protector is breathable, provides no heat, no rustling noise when the child turns a lot while sleeping. 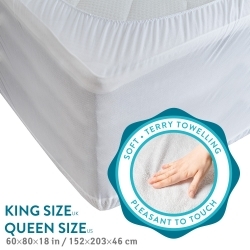 Terry towelling cotton is soft to feel, perfectly covers the mattress from edge to edge and gives ultimate comfort. 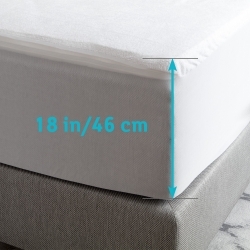 Fitted design - protector stays in place night after night due to extra deep side skirt for all types mattresses. King bed size, for mattresses with dimensions: 80 X 60 X 18" (152 X 203 X 46 cm). Machine wash 40°. Do not tumble dry.